Gracewil Country Club offers 36 holes of public golf at affordable rates less than 10 minutes from downtown Grand Rapids. With four nines available, you often can simply walk in and get a tee time, but reservations are warmly accepted. Call us today and reserve a tee time for yourself or your foursome. 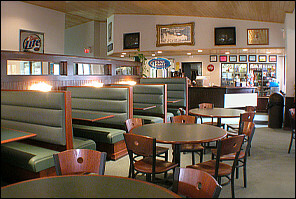 Bar/banquet seating: Our facilities can accommodate up to 175 people with space for an additional 100 people on the covered porch. Food and beverages: Beverages of all sorts as well as fresh-made sandwiches and salads are available throughout the day. Outings: Our golfer-friendly 36 holes and outdoor deck make Gracewil a great place for outings. Learn more about how your group can enjoy a fun-filled Gracewil outing. Be sure to keep us in mind for your next holiday party, rehersal dinner, catered event or banquet. For more information and links to our event menus, please click here. Has your group considered hosting a weekly league? Gracewil is now reserving times for the 2019 season. With 36 holes, your group will experience all four nines in our rotation. Tthere are times available MondayFriday to accommodate various size groups. Leagues are allowed to pay weekly (no advance payment required). If your league has 20 golfers or more, your secretarys green fees will be waived. For more information or to check availability, please contact us @ 616-784-2455. Gracewil is the sponsor and home course for the Kenowa Hills golf team. as a family owned and operated public golf course.